Beautiful Triple Black 1968 Corvette Roadster rolling on Chrome 17" American Racing Special Edition wheels. 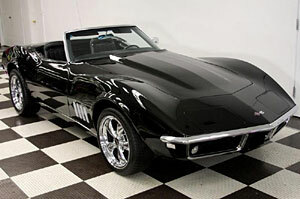 This Black Roadster has a fantastic mirror finish paint job over a very sleek and beautiful body with great panel fit. The car has numerous NEW parts added to it. The car has a beautiful BRAND NEW black soft top BRAND NEW front bumper, BRAND NEW rear license plate surround, BRAND NEW tail lamp lens, BRAND NEW emblems, BRAND NEW door handles, BRAND NEW mirror, BRAND NEW fender gills, BRAND NEW rocker moldings and BRAND NEW windshield just to name a few. The underbody structure is in great condition and with new factory exhaust and shocks. 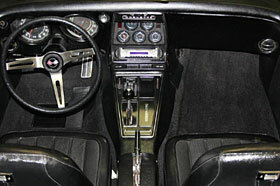 This 68 Corvette interior is factory black and has a BRAND NEW cushion grip steering wheel, BRAND NEW front carpet, BRAND NEW kick panels. A BRAND NEW Pioneer AM FM CD. This car shifts through the gears effortlessly with a 3-speed automatic transmission. Power steering and 4-wheel disc brakes give the car the ride and stopping power and th handling of the car makes this black beauty a dream to drive. 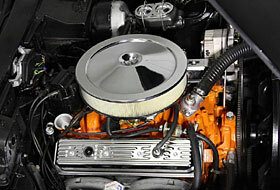 There is and almost BRAND NEW 350 Chevrolet Crate Engine with plenty of torque.